As many collectors, I started with pinfire revolvers. Within pinfire weapons; revolvers, rifles and pistols, there is a broad range of collectible guns from cheap to expensive. Revolvers in need of a restoration are often the cheapest of antique guns and offer a good basis to learn about the technique of repairing and restoring. At the moment I own just a few but that number used to be greater. The history of pinfire revolvers started in 1854 when Eugene Lefaucheux started producing his model 1854 revolver, caliber 12mm pinfire. The pinfire cartridge was invented by his father Casimir Lefaucheux and first patented in 1835. Eugene Lefaucheux inherited his fathers business and after 1854 expanded rapidly. The pinfire revolver was one of the first revolvers using catalytic cartridges instead of the percussion system, which used lose powder, bullet and percussion caps. By 1890 the pinfire system was outdated and only some small firms carried on its production till it did not sell anymore. Because of this small time span and large produced quantities for both civilian and military use the pinfire gun can be an interesting topic for collectors. But of course the pinfire system is not the only one. Before the pinfire area there was the percussion system and before that the flintlock. Besides that many more other systems existed, such as the "Zündnadelgewehr"/"needle-gun" that used catalytic cartridges in a rifle as early as 1836. It is by no means my goal to make an overview of all systems and time spans. 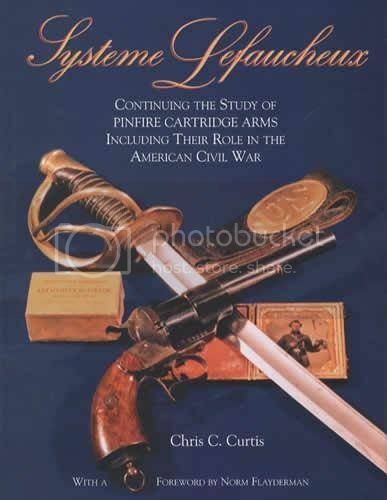 A very good book about pinfire guns is the "Systeme Lefaucheux, continuing the study of pinfire cartridge arms including their role in the American Civil war" written by Chris C. Curtis. To learn more about European guns, especially those made in Belgium, can be done by visiting www.littlegun.be. A tremendous large, detailed and good site. Much information about guns from other countries are to be found on www.littlegun.info.